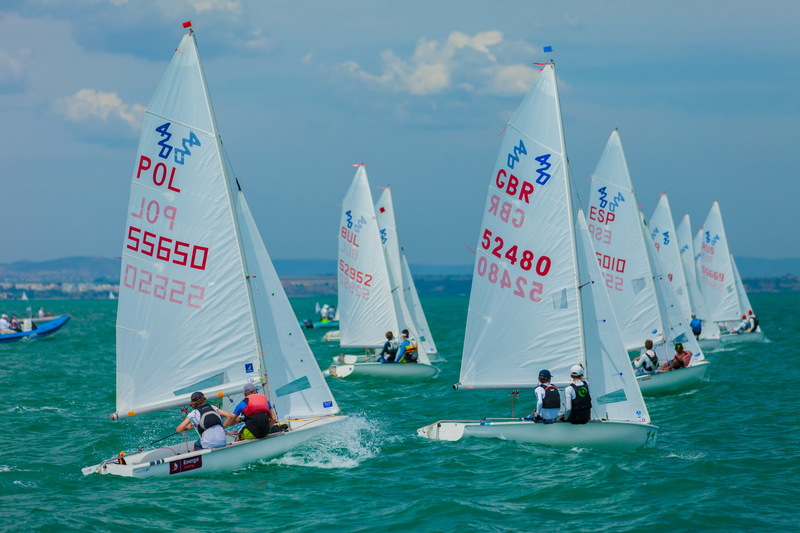 Race day 3 at the 420 and 470 Junior Europeans featured the first day of final series racing for the 470 Men gold and silver fleets and marked the cut-off point to split the ninety boat 420 Open fleet into gold and silver. A two-hour postponement ashore transformed into a stable 12-15 knot breeze, stretching the legs of teams and seeing some changes in the leader board from the 2 races for all fleets. No change in the series leaders who maintain their hold at the front. 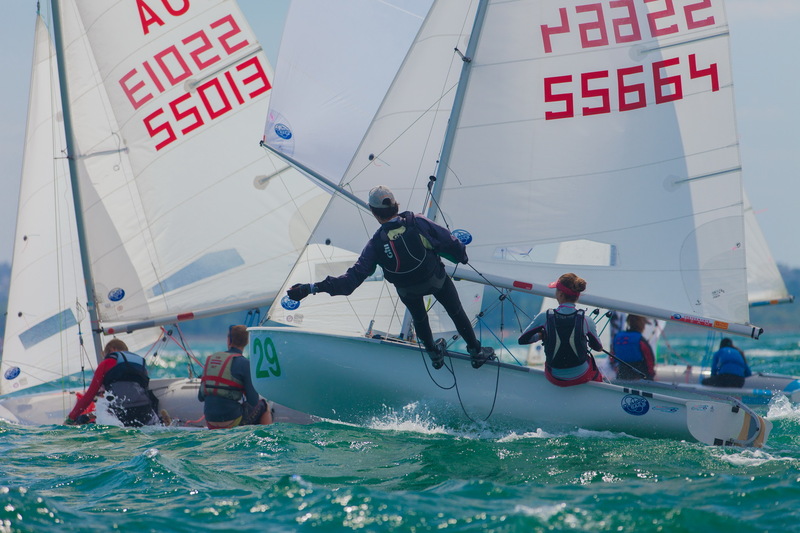 The USA’s Wiley Rogers/Jack Parkin continue to be on fire in the 420 Open fleet, knocking out two more genius wins today. Right now, they look to be unstoppable and dominate the forty-five teams qualified to gold fleet racing. Second placed Souzana-Ioli Bakatsia/Nikoletta Efstathia Papageo (GRE) are keeping the Americans close in their sights, securing matching wins in the blue fleet. But it will take a day of disaster to unseat the Americans. The series discard kicked in after race 5, giving some leaderboard changes, and accelerating Greece’s Nikolaos Brilakis/Georgios Karadimas up the leaderboard to third, helped by their 3,2 performance. The 90 boat 420 Open fleet is now split into equal fleets of 45 boats for the gold and silver fleet six race final series, with 2 races scheduled on Thursday 13 August. 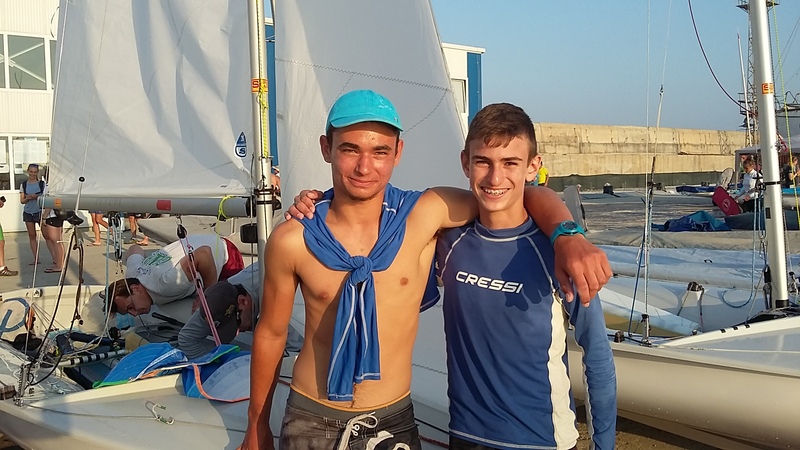 Another super consistent performance from series leaders in the 420 under 17 fleet, Ido Bilik/Ofek Shalgi (ISR) who doubled their points advantage over the fleet. 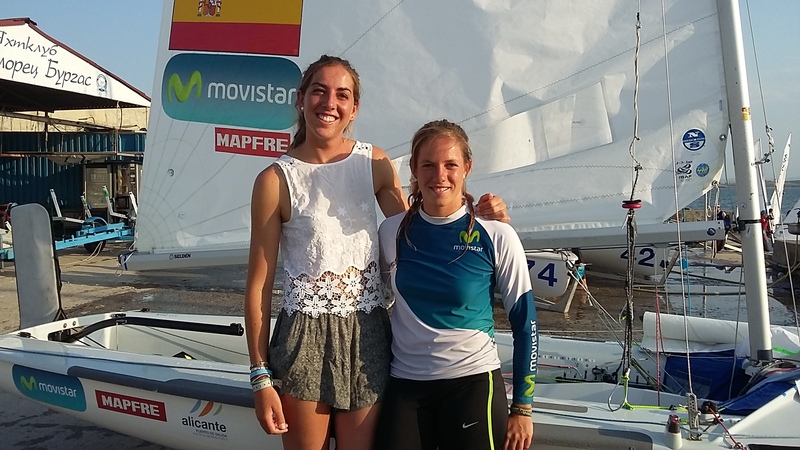 The pair picked up the bronze medal at the 2014 420 World Championships, but chose to race the new under 17 age fleet for the Junior Europeans, for one simple reason. Moving up to second are Aggelos Arvanitis/Theofanis Kanakaris (GRE) who can now discard their 16th place result from race 3 and finished close to the Israelis with two second places. Brothers Carlos Balaguer/Ignacio Balaguer (ESP) drop one leaderboard place to third. In 7th overall, Theresa Loffler/Theresa Heilingbrunner (GER) hold the card of top placed girls team. 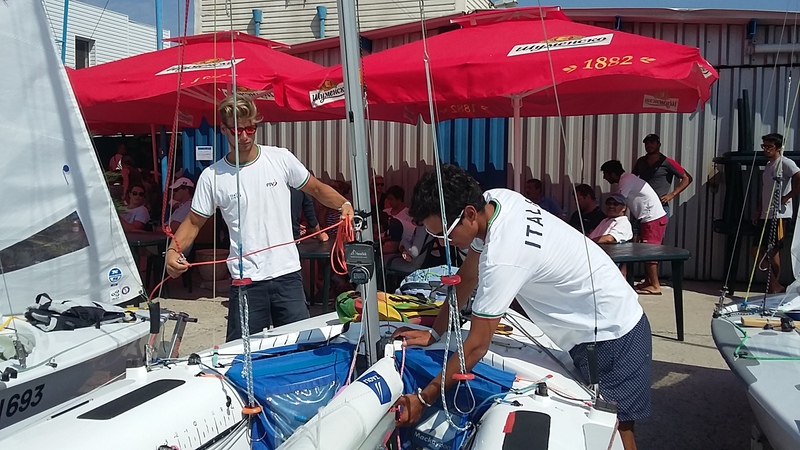 Matteo Capurro/Matteo Puppo (ITA) raced a day of two halves, winning race 6, before scoring their worst result of the series, a 17th which now counts as their discard. With two double-digit result on their scoreline, they have little room to manoeuvre. Consistency is the name of the game. Three Spanish teams are in hot pursuit of the Italians, with just 4 points separating them in second to fourth on the leaderboard. Second placed David Charles /Alex Charles are the only team counting an all top-ten scoreline, and their consistency looks set to reward them further as the Championship unfolds. Claiming the win in the day’s second race were Turkey’s Halil Demirel/Firat Sahin who move up into the top ten. Spain’s new partnership of Silvia Mas/Paula Barcelo continue to work their magic on the race track, scoring a 3,5 to extend their points advantage. Only last year, they were rivals in the 420 Class, but decided to join forces and focus on a campaign towards Tokyo 2020. 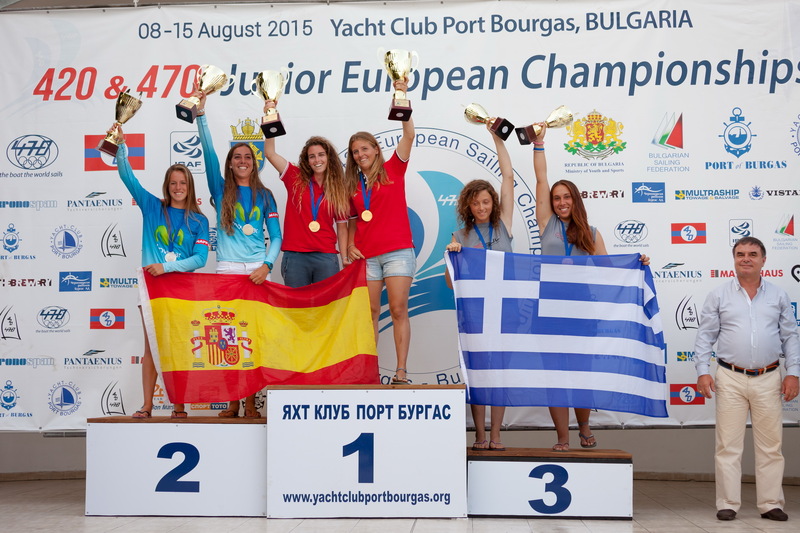 Team-mates Bàrbara Cornudella Ravetllat/Sara López Ravetllat, who are also cousins, sit in second with the recently crowned 470 Junior World Champions Benedetta Di Salle/Alessandra Dubbini (ITA) moving up to third overall. Just last year Mas and Barcelo were competing at the 420 Worlds, finishing 8th and 7th respectively, but a proposal from Barcelo set the friends’ new partnership in the 470.